ANAHEIM, Calif. - Clay Buchholz said he was nervous upon his recall to the Red Sox last week, when he walked five and gave up five hits in five innings. After an even worse time of it last night, when he gave up eight runs - four earned - in just 4 2/3 innings of Boston's 11-3 loss to the Los Angeles Angels, the Sox may also be having some jitters about reintroducing the rookie righthander to the perils of a big-league summer. "A lot of guys who are sent down come back up and want to prove a point," Buchholz said after taking his second loss in two starts since being summoned back to Boston. "They don't want to get sent back down. You can't think like that. But sometimes you can't help but think like that. "When I was in the minor leagues I just went out and pitched. That's why they brought me back here, because I pitched good in the minor leagues. I've got to figure out something to do, something different. Maybe some different thoughts." While Manny Ramírez couldn't suppress a smile while playing Maicer Izturis's pop fly into a bloop triple - the ball wound up under the outfielder's rump in a three-run sixth inning - an impassive Theo Epstein sat behind home plate and watched the Sox taken apart by an Angels team grown weary of having their Octobers blown up by Boston. 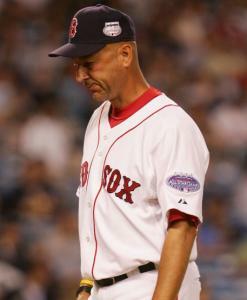 A two-out error by shortstop Alex Cora on Torii Hunter's fifth-inning chopper led to four unearned runs that broke this one open after the Sox had erased an early 3-0 deficit against Angels righthander John Lackey with home runs by Kevin Youkilis - he has 16, matching his career high - and a bases-empty home run by Ramírez, his 19th, which tied the score in the fourth. "I got the hop I wanted, I just missed it," Cora said of his error, which allowed a run to score and was followed by a two-run single by Garret Anderson, who went 4 for 4 and knocked in five runs, and a two-run single by Howie Kendrick after Buchholz was pulled for reliever David Aardsma. "That changed the whole complexion of the game," Cora said of his error. The Angels had regained the lead on a home run by Anderson, his ninth, in the bottom of the fourth. "I started him with a couple of changeups, and I usually get a lot of offers," Buchholz said. "He didn't offer after it. I tried to go in with a fastball, and left it belt-high." The Angels tagged Buchholz for back-to-back doubles and a single four batters into the home first before his night took an even worse turn. Hunter, the free agent outfielder signed to help tilt the balance of power in the Angels' favor, fouled off the first four pitches from Buchholz, then made the kid run through his entire repertoire before working a 12-pitch walk. Anderson followed with a line single, and the Angels had a 3-0 lead. "The first inning seems to be biting me," said Buchholz, who gave up two runs in the first inning last Friday against the Orioles and has given up a total of 10 first-inning runs in 10 starts. "I can't make the big pitch and can't get the big outs. I won't say I can't, but I'm not right now. "I thought I had Hunter with a couple of pitches that he just got a piece of. That was a good at-bat for him." The Angels have lost nine straight postseason games to the Sox, including three-game sweeps in the Division Series in 2004 and 2007, and while they brought the best record in the American League against the Sox last night, they appear saddled with the same issues that have plagued them in past October matchups against the Sox: With a team that ranked 11th in the league in runs and ninth in home runs, the Angels have a similar look to the team that was outscored, 19-4, by the Sox in the ALDS last October. Last night, for example, their No. 3 hitter was Izturis, despite his modest totals of 3 home runs and 30 RBIs. Izturis had three hits, including a 220-foot triple that a late-charging Ramírez was unable to collar with a sliding attempt. He then rolled over and discovered that bulge in his back pocket was the ball. "I felt like I was swimming in a swamp," said Ramírez, who got an earful from the Angels' bullpen. While the Sox were held without a hit after Ramírez's home run to start the fourth - some terrific infield defense by Izturis and Kendrick took hits from Cora and Jacoby Ellsbury - the Angels tacked on three runs in the sixth, abetted by Ramírez's pratfall. Before this one was over, Angels manager Mike Scioscia was clearing his bench. "They remind me of a rich version of the Minnesota Twins," Cora said. "They play the game right, and they have a manager who puts everyone in good situations like Tito does here. Obviously, they've got the big bopper when Garret and Vladi [Guerrero] are swinging good, their pitching is pretty good, and they make the plays in the field." "Hopefully, we'll get a chance," Scioscia said. "But thinking about who we're going to be facing then is the furthest thing from my mind."